They say you have 7 seconds to make a first impression and reception areas are frequently that first space that visitors see. It’s imperative, therefore, that they convey the ethos of your institution from fun and welcoming to serious and business-like, reflecting the spaces into which students may well progress in the world of work. 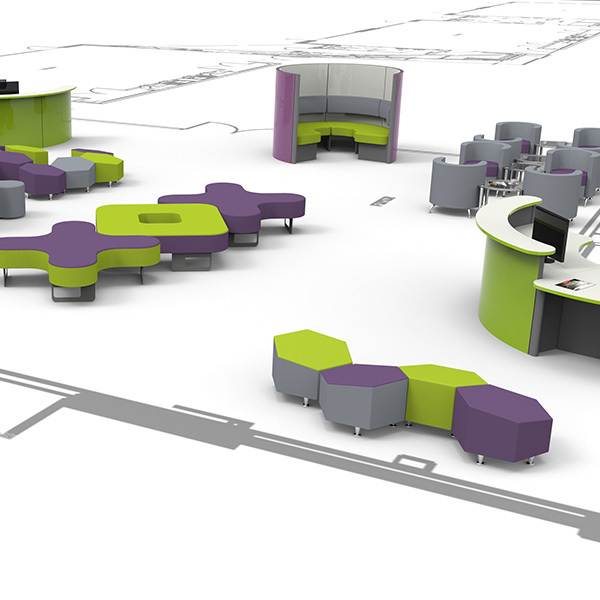 So it’s not just the reception desk that’s important, but what, and how information or student’s work is displayed, the style and form of seating, as well as colours and finishes that are used. Our product collections add a sense of style and quality to any reception area, whilst also accommodating the practical considerations of an educational environment. 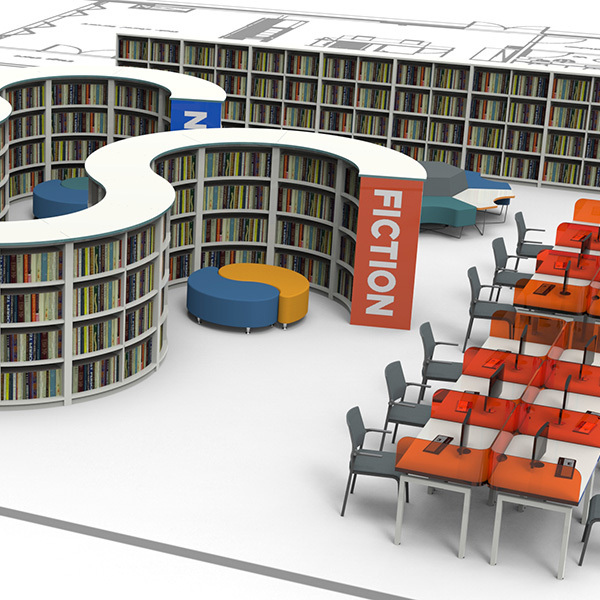 Libraries have evolved from fusty old rooms with row-upon-row of books and where the librarian peers over the top of their glasses hissing hush! 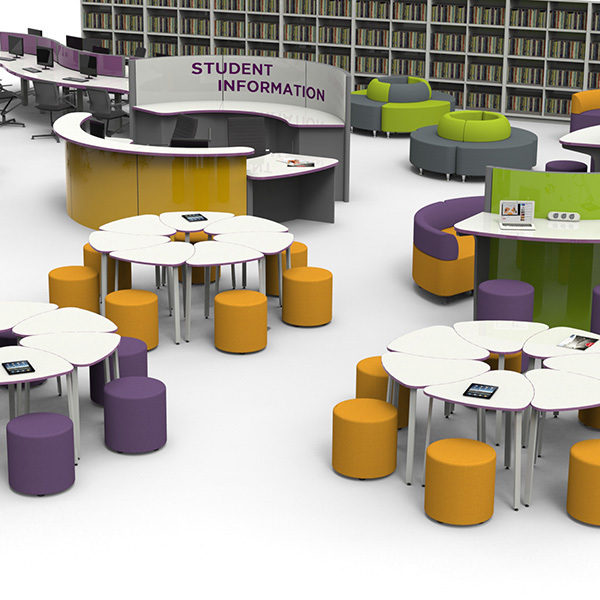 into vibrant spaces that recognise and embrace the different sources of information now available to students. They have eBooks, and access to the internet and where students are encouraged to explore, and question the validity of data. Large, non-owned spaces offer opportunities for bigger groups to learn together or whole year groups etc for example. 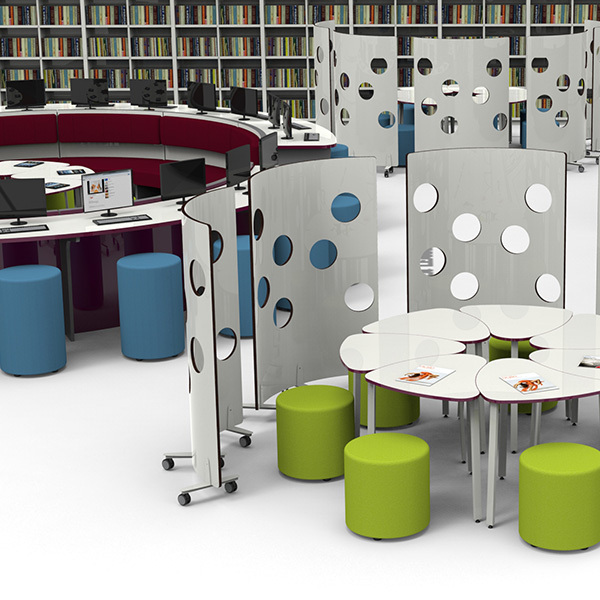 Especially appropriate for the thematic curriculum, or alternatively to support a number of different groups have access to spaces that promote group study, learning studios typically provide different spaces that support different activities. For example, whilst science laboratories are ideal spaces in which to conduct experiments, they may fall short of providing appropriate spaces to write them up. 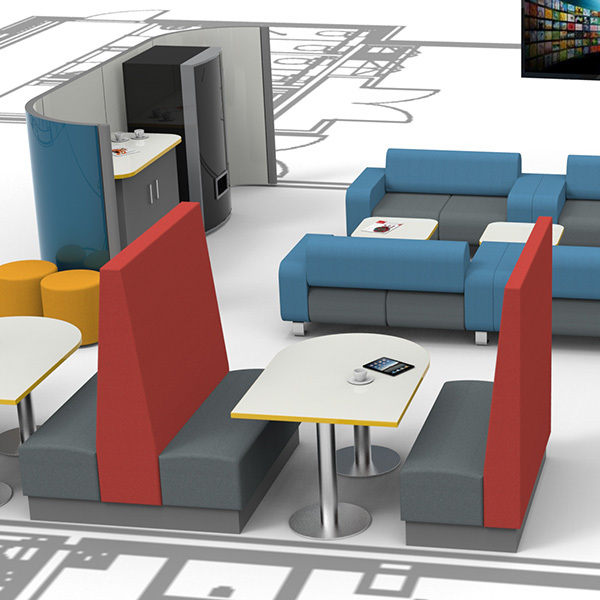 Design technology workshops are ideal spaces to create and build stuff, but are they the spaces in which you would design or draft proposals? 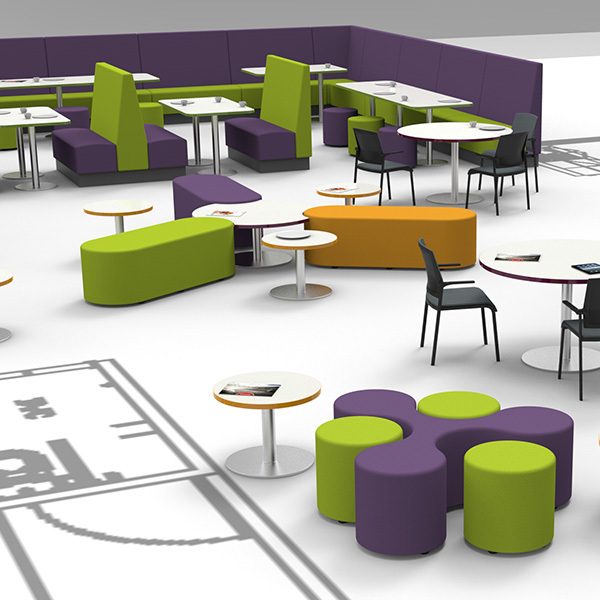 Open learning studios frequently create spaces that achieve this, allowing specialist spaces to be just that. Whether it’s snatching a couple of minutes with faculty colleagues, or collapsing after a double period with bottom set Year 11’s, the staff room needs to fulfil a number of different functions. 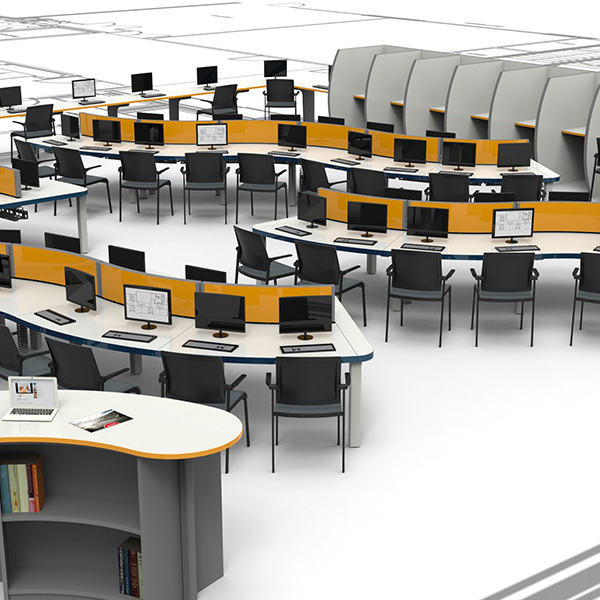 Furnishing it appropriately demonstrates a respect for your teachers and lecturers professionalism, enabling them to go into lectures and lessons refreshed, and prepared. Promoting self-directed, autonomous study, empowers students to take control of their learning. But everyone learns in a different way, some wanting quiet and the privacy of a carrel, whilst others will happily study listening to music whilst texting friends. Add this to understanding how to manage BYOD, and you’ll realise why LRCs have evolved into vibrant learning spaces that offer a variety of environments in which students can choose where they study; around a circular table, for example, working collaboratively with others, sat comfortably in an armchair reading or squirrelled away in a booth, oblivious to anything thatís going on around them. ICT-rich spaces are now frequently equipped with high-spec computers that can support video streaming, graphics editing and the transfer of high volumes of data. And they often incorporate specialist peripherals such as 3D printers. Most, therefore, remain fixed PCs or Macs, connected by cable (data and power) rather than relying on batteries and wireless. Managing these cables safely and tidily becomes entirely relevant, whilst also creating spaces that are engaging or reflecting the frequently long periods of time and intense work that is carried out there. 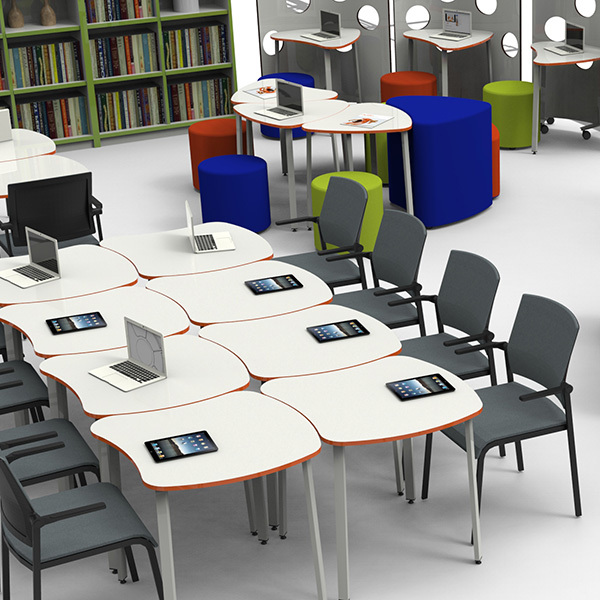 Classrooms with row-upon-row of linear tables and the teacher standing at the front no longer support all pedagogical styles used in schools and colleges, meaning more and more learning spaces are furnished in ways that enable them to adapt to a number of different approaches to teaching and learning. If nothing else, they become spaces students actually want to be in, encouraging them, where appropriate, to be creative and work collaboratively. But more so, they enable teachers and lecturers to deliver the lessons they want to, rather than those they are able to in that room. Whether you need a flexible space that you can clear for other activities, or an all-day café or restaurant, getting the offer right in dining spaces is increasingly important, in some instances removing the temptation for students to go off-campus and eat elsewhere. Hygiene and durability become paramount in these high-use spaces, where, of course, social interaction is encouraged. The ethos of your school or college is reflected here too, with perhaps a different solution for schools where this is the single nutritious meal a student has each day to one on a college or university campus where FE or HE students will graze throughout the day. Whichever, our portfolio of products create stunning dining spaces.